Rosemary is one of the most popular culinary herbs and it also makes a wonderful aromatic plant. It is well-suited to drying and retains much of its flavor and color when dried. This tasty herb is one of our favorites. While fresh rosemary is always our first choice, dried rosemary works quite well for many dishes. We’re going to talk about drying rosemary, substituting dried or ground rosemary for fresh rosemary and other uses of dried rosemary. When rosemary is dried, it tends to retain much of its scent. 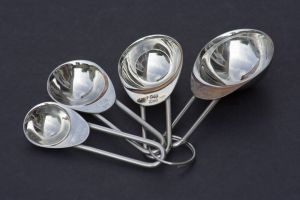 While the needles do curl slightly, they shrink only minimally. One of our sources did mention that dried rosemary has 25% less manganese and 40% less calcium and iron than fresh. Keep in mind though that a 2 teaspoon serving of fresh rosemary only fulfills about 4% of the calcium and 5% of the iron recommended for consumption each day. I didn’t find how much manganese fresh rosemary contains but I suspect it is a similarly small amount. The most commonly found form of dried rosemary includes small pieces of stem and entire dried leaves. This form preserves the most essential oils of the rosemary plant and is the most flavorful. However, it is prone to not softening while cooking and can leave your dish with bits of twiggy and sharp bits of the herb. Using dried rosemary in scrambled eggs used to be a favorite in our house but I really hated the occasional hard pieces. At least one herbal company sells their dried rosemary slightly chopped. They take the dried pieces and cut them up into quarter-inch pieces. Chopping them slightly would probably retain more of the scent and flavor while making them a little less twig-like. I would suspect based on their more compact nature, you would require slightly less chopped dried rosemary than un-chopped dried rosemary to obtain similar flavor. Personally, I don’t know if it wouldn’t be easier to leave the dried rosemary fairly whole and chop it when being used – seems like it would be more flavorful that way too. Our latest find was a bottle of ground rosemary. They took dried rosemary and ground it to the consistency of flour. No more twigs! We’ll definitely be grinding some of our dried rosemary, when that bottle runs out. Sure, the flavor isn’t as good as fresh but not having little twigs in the food is worth it. Green eggs and ham anyone? Scrambled eggs with ground rosemary are delightful though I will warn you that they do turn a most unusual shade of green. The substitution ratio of fresh to dried rosemary is one-to-one…one tablespoon of fresh rosemary = one teaspoon of dried rosemary. Where things get a little less clear is when a recipe calls for sprigs of fresh rosemary or when using ground rosemary. According to one gardening forum member, one sprig of rosemary generally equates to one one tablespoon of fresh rosemary leaves. However, those recipes which call for a sprig of the herb are most likely going to remove the sprig of rosemary before serving the dish. If that is the case, it might be smarter to use a spice bag where you can remove the rosemary once the dish is fully cooked. Or, if you don’t mind adding a bit of green to the dish, use ground rosemary. I know it can be tempting but its best to wait for your rosemary plant to mature prior to harvesting anything more than a few fresh leaves. The optimum time for harvesting rosemary is just before it flowers – that is when the flavor is at its peak. It can be harvested any time of the year but should not be pruned while it is flowering. Do keep in mind that in the fall, rosemary, particularly if brought in doors, is regaining its strength after flowering. It’s best to limit the amount of pruning or harvesting you do during this time. And, always cut, not break, your rosemary. All of our sources recommend harvesting rosemary for drying in the morning. However, one said to harvest 5-6 inch long stalks in the “early morning” and the other said to harvest after the previous night’s dew had evaporated but before the high heat of the day. Personally, we like to rinse our rosemary stems to remove any dirt or bugs which might be hiding among the leaves. So, a little morning dew remaining on the sprig of rosemary would be rinsed off anyway. There are several different ways that you can dry rosemary. The most traditional way to dry rosemary is to tie up to 8 sprigs into bundles and hang for a month or so. Herb lovers have different opinions on the best way to do this. We generally put several bundles on a coat hanger and keep them in a dark place with fairly good air flow but not a lot of activity. We turn the hanger around every day or two to ensure the rosemary dries evenly. Studies have shown that drying rosemary indoors, rather than outside, will provide the best color and flavor. You’ll know the rosemary is fully dried when it is no longer bendable. The risk of this method is that some of the leaves might fall off the branches. One way to solve the issue of lost leaves is to hang the bundle inside of a brown paper bag. Several gardeners take this a step further by putting the bag of rosemary in the crisper drawer of their refrigerator. 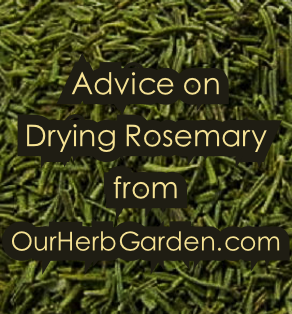 Another option for drying rosemary is to use a dehydrator until the stems break when they are bent. Rosemary Steamed Veggies – throw some dried rosemary in the water when steaming vegetables, it’s particularly tasty with zucchini. Smoked Meats – throw some dried rosemary on wood chips to smoke lamb or chicken. Rosemary Bread – one baker suggests adding dried rosemary to some olive oil, warming it, letting it sit overnight and then adding it to the dough to soften the leaves and impart even more flavor.